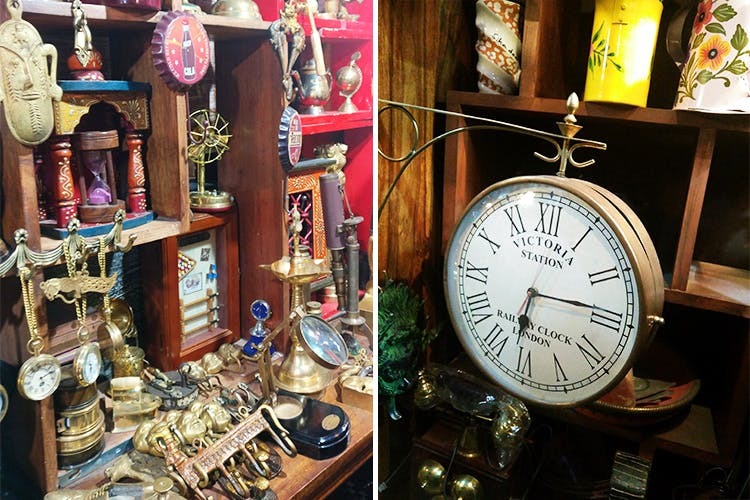 Deep within the busy (and crammed) lanes of the furniture market in Amar Colony, there’s a home decor and antiques shop that sells all things cool, kitschy, and useful. Enter the flea market from the small lane besides the park it's built around, walk straight, sharp right, walk some more, and there it is, on your left—shop number 24. Yeah, the directions might seem confusing, but believe us, it’s totally worth scratching your head for a couple minutes for (or, you know, just ask for the shop number). The little shop, run by a lovely, old fella named Jolly, is full of decor pieces you might see in a bar, a restaurant, or even a well-decorated store. You’ll find huge versions of beer bottle caps with your favourite alcohol brand or rock band’s name shining through, foldable lamps, clocks that look like they came right out of the Game of Thrones universe, showpieces you can actually show off, and antiques you never knew existed (or that you wanted). If you’re the kind of person who likes to collect offbeat and quirky antiques, gets lost looking at Victorian wall clocks or just wants their living room to stand out, you’re in for a treat. We couldn’t possibly describe the shop in its full glory; there’s just so much going on in there, so we suggest you make a quick trip to this shop number 24 and shop your heart out. The shop is open seven days a week, so if you get time only on the weekends or have an erratic schedule, you can check out this little gem literally whenever you want. Given that it's Amar Colony, the narrow lanes and crammed parking spaces make it inconvenient to take your car there – it took us around 15 minutes just to find a place to park. They've got a lot of stuff that's both light and heavy on the wallet (but all worth it) – the pricing ranges from as low as INR 400 for a small showpiece to INR 6,000 for a foldable lamp.